Minnesota Attorney General Lori Swanson slammed Comcast Corp. on Friday, alleging in a lawsuit that the cable TV and internet giant overcharged customers for cable packages, charged consumers for unordered services and didn’t deliver the prepaid Visa cards promised in its promotions. Comcast, also known by the brand name Xfinity, added home security, service protection plans, modem and other equipment charges to customers’ bills without authorization, Swanson told reporters. To lure some customers, Swanson’s office said Comcast promised prepaid Visa cards of $200 or more if they remained in the minimum-term contract and up-to-date on monthly payments for 90 days, but did not deliver. “It’s hard to shop for cable television if a company plays hide-the-ball on its true prices, and people shouldn’t have to watch their bills for things they didn’t buy,” Swanson said in a statement. The lawsuit filed in Hennepin County seeks unspecified restitution and civil penalties. Comcast responded saying it fully discloses all charges and fees and that the facts don’t support Swanson’s allegations. “We’re committed to our customers in Minnesota, and it’s important to us to make sure customers completely understand the products and services they order,” said company spokesperson Jill Hornbacher. Yesterday industry folks had an opportunity to provide updates to the House Commerce and Regulatory Reform Committee. Speakers included representative from Minnesota Cable Communications Association, Minnesota Telecom Alliance and AT&T Wireless. The presentations were similar to those given (by the same folks) to the Senate last week. The speakers were kind enough to share those with me last week – you can see them here. All three groups mentioned a desire to get fiber closer to the home/premise. I also took notes, which I’ll include below. It seems like there were more questions yesterday. Several Representatives were concerned about changing regulation for phone calls (landline versus VoIP) at the expense of consumer protection. One of the big concerns seems to be that VoIP requires power – so when the power goes out, the VoIP phone doesn’t work. (They have some power generators, but it’s a risk.) The push back is that VoIP is much more cost effective for the provider, especially since many customers are “cutting the cord” and going with cell phone options. With wireless, there were questions about timeline for 5G and distance limitations. The standards for 5G have not been set yet. But AT&T wants to hit the ground running so they are currently working on small cell deployment. (Small cells make 5G work – they also improve 4G access.) Increased small cell deployment should help with distance issues – because there are distance limitations on 5G, which does make it a better solution for urban markets. Representation Hoppe remarked that they can’t legislate faster than technology can change. Urban broadband is a cable game – rural broadband is DSL: how can that help us plan? The FCC recently released the Industry Analysis and Technology Division Wireline Competition Bureau. It’s the culmination of FCC Form 477 filled out by providers. I think there’s an interesting look at speeds by technology and location (metro vs rural) of technology. First location – the following graph tracks ratio of subscribership by household density, or who serves urban areas and who serves rural areas. The answer is DSL is a big player in rural areas; cable is the biggest player in towns and cities. Fixed wireless and satellite are players in rural areas and almost non-existent in urban areas. This graph does not track speed – just technology. Now it’s helpful to look at what speeds. When we look at access by speeds or 10/1 we see representation of all technologies. 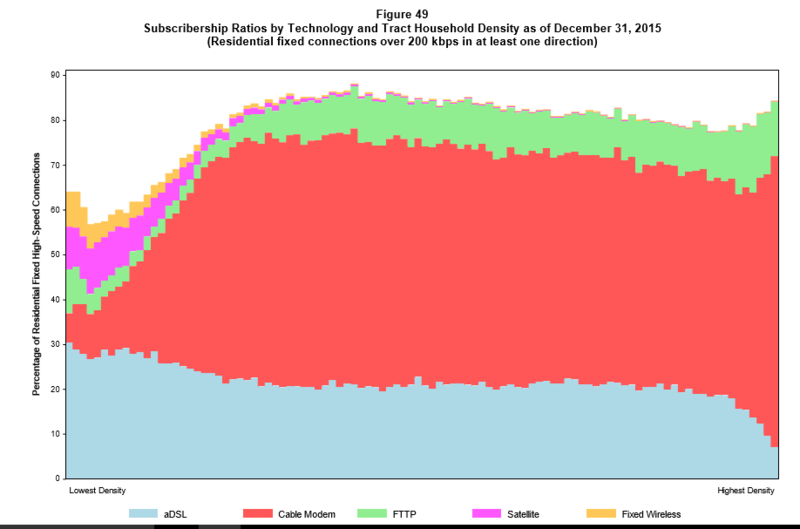 When we look at speeds of 25/3, DSL is no longer represented. 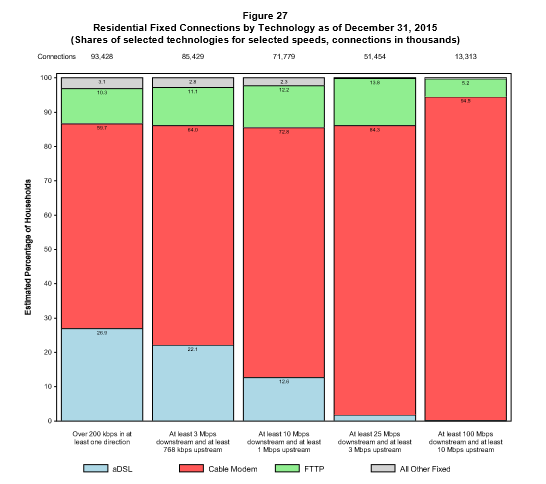 DSL has a larger share of slower connections. DSL has a larger share of rural connections. The Minnesota legislature has defined speed goals or 25/3 by 2022 and 100/20 by 2026. They have dedicated funds to making it happen through the border to border grants. So there’s a recognized need for support, but the question is how to increase speeds in rural areas. Do tools used in urban areas help rural connectivity? Do policy makers understand that there’s a significant difference in the two markets based on population density, distance to customers, limitations of transport technology and regulations and expectations of technologies based urban scenarios. Mediacom Park, NY – December 7, 2016 – Mediacom Communications today announced the company’s entire broadband network will be gigabit-capable by the end of 2016. Mediacom will become the first major U.S. cable company to fully transition to the DOCSIS 3.1 “Gigasphere” platform, the latest generation of broadband technology. As a result, virtually all of the 3 million homes and businesses that Mediacom serves across its 22 state footprint will be able to enjoy speeds that are up to 40 times faster than the minimum broadband definition set by the Federal Communications Commission (FCC). Mediacom’s network enhancements will provide a significant boost to the company’s internet speeds. The company’s new minimum entry level speed for residential customers will increase to 60 Mbps while flagship offerings of 100 Mbps and 200 Mbps will also be available. Moreover, Mediacom will begin rolling out ultra-fast 500 Mbps and 1-Gig (1000 Mbps) products on a market by market basis in the coming weeks. The cable network is composed of a hybrid of optical fiber and coaxial cable elements, and the specification that enables use of the network for broadband is known as Data Over Cable Service Interface Specification, or DOCSIS®. Gigasphere is the brand name for products and services that use a technical specification called DOCSIS 3.1, the next generation of DOCSIS services developed and advanced by CableLabs, the U.S. cable industry’s research and development consortium, and its members. DOCSIS 3.1 provides a near-term path toward continued improvement of cable broadband performance, with network capacity of up to 10 gigabits per second in the downstream and up to 2 gigabits per second in the upstream. Equipment vendors are now supplying the necessary components. In January 2016, CableLabs certified the first DOCSIS 3.1 cable modems. 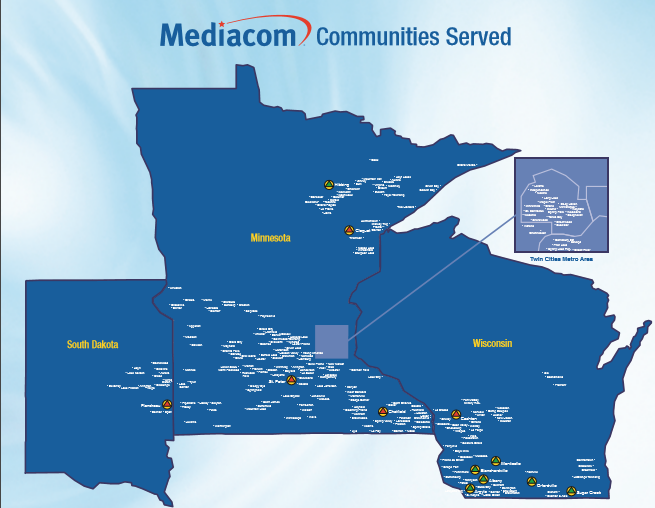 Mediacom Communications Corporation is the 5th largest cable operator in the U.S. serving over 1.3 million customers in smaller markets primarily in the Midwest and Southeast. Mediacom offers a wide array of information, communications and entertainment services to households and businesses, including video, high-speed data, phone, and home security and automation. Through Mediacom Business, the company provides innovative broadband solutions to commercial and public sector customers of all sizes, and sells advertising and production services under the OnMedia brand. More information about Mediacom is available at www.mediacomcable.com. Last week I had the pleasure of attending the MACTA (Minnesota Association of Community Telecommunications Administrators) annual conference. These are the folks who work for local government on telecom, cable and broadband issues – which both an interest supporting broadband but also protecting public right-of-way. It was an interesting look at a group of folks who wear a lot of hats. I’m going to start off topic to mention the format of their first session – 60 ideas in 60 seconds. They had four presenters – one very technical, one on regulations, one on producing TV show and one on social media. It’ was something for everyone. Very fast paced. Should be the start of every conference! What happened during the State’s 2016 legislative session AND what is happening at the federal level that may affect cable, broadband and telecom policy? How will the election year affect legislative activities? Key legislators and policy experts will address these items … and more. People in other states are jealous of Minnesota. We a have good foundation: the Task Force, very early roundtables that got everyone’s view to find common ground. We have three years in a row of board to border grant legislative. In other states there are drives to stop such efforts. 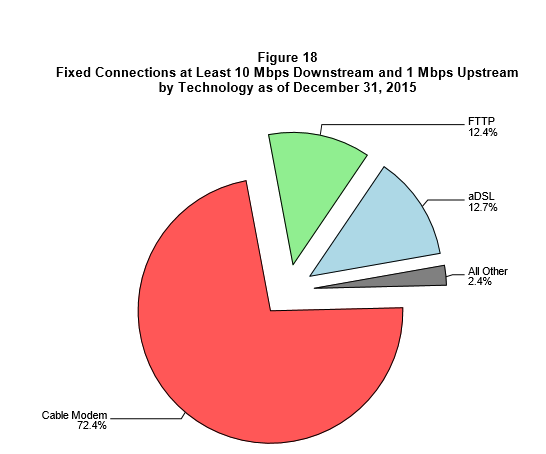 In Colorado, they have a super majority rule to hinder city-led broadband efforts. There were dozens of cities that have voted away from that – but they are steps behind Minnesota. What do we want in the future? We have 201 legislative seats open this year. That will mean more education with policymakers again. Fiber is the foundation. Wireless is the blanket on top. And rights of way is the third leg of the stool. Fiber and a wireless is never an either/or proposition. Knowing that there are federal efforts does not make it OK to not have a state focus too. Local franchising – can that come up in Minnesota again? We have a second entrant in the market (CenturyLink). Google has said that removing the barrier of local franchising would make it easier to enter the market. We need to consider budget with rights of way. It’s an asset that some folks don’t consider. VOiP – did not get through. Big question is – Is it a telecom service or an info service? Consumer protection folks are opposed to calling it an info service, which would make it easier to deregulate. 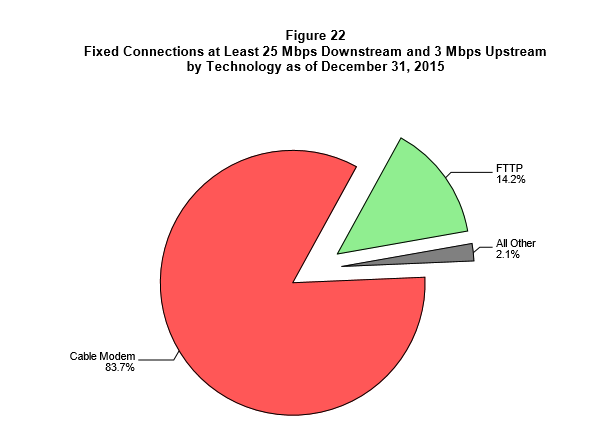 MAK – Broadband became an issue, which elevated the telecom issues as well. 3 years ago we recommended $200 million. We were pleased to see $100 million from Governor and $85 million from Senate. MAK – The $500,000 for low income household is a door open to digital efforts in the state. Looking into public housing initiatives is one way to do it. Also we need to look into where people in poverty leave. We need to remember that poverty has an impact in urban and rural areas. We need to look at racial and location inequities. A big question is – what is affordable? We need to give guidance with affordability. We know if you subsidize broadband for 18 months, they will find a way to keep it. We are also looking into cyber security. And workforce issues around cyber security. VOiP proposal probably will come back next year. Task Force supports modernization and VOiP bills. We do want to see continued consumer protection. QUESTION – Do you see anything in Minnesota saying we want to get rid of local franchising? But it’s not been a strong issue. Maybe we need to look at the approach – are there opportunities for efficiencies. Simply – is there a better way of doing this? Local franchising authorities worry that incompetents have taken the stand a that they have. We would like to work with other providers – but the incumbents are watching every more. We need a safe method to be able to bring concerns safely to the State. We need to look at all approaches that make sense. But it’s not always an even/or. We need to understand each other’s concerns. We need impact from local communities. We need to educate policymakers about the different before wireless and fiber. Based on a recent query of MACTA members, cable franchise renewals and competitive franchising remain hot topics for many Minnesota cities and franchise administrators, as does tracking consumer protection complaints and consumer protection issues. This session will cover these items and any other hot topics that are current at the time of the conference. Comcast is the current cable franchise holder in Eagan – CenturyLink is looking to have a franchise as well. This presentation to the Eagan City Council is from an attorney on the topic. The presentation is really a look at why the Council should consider a second franchise and under what context. You can watch the video. Or see the PPT presentation. The attorney really sets out what needs to happen to smooth the path to providing a franchise agreement to CenturyLink – looking at potential local and federal policy issues. It sounds like July 21 would be the time that CenturyLink would actually present their application. It will be interesting to watch the process – in part because some of the agreements made with Comcast are not recent and the policies surrounding the issues are not necessarily recent. Although it sounds like Eagan does have fairly updated information on what residents want from a cable franchiser holder.